I love how fresh flowers can instantly brighten up a room, and when Blossoming Gifts contacted me offering the chance to try their Autumn range of bouquets, I couldn't pass up the opportunity. I really struggled to pick a particular bouquet from their collection, but eventually settled on the "Woodland" bouquet as I figured it encapsulated the feeling of Autumn perfectly. Contained within the bouquet are orange, or "tiger" lilies, cherry brandy roses, burgundy hypercium berries and autumn birch. The flowers arrived the next day using their flowers by post system, and the lilies were still buds when I opened them up. I thought this was great as it meant I could prolong the life of them and keep them on display for longer. 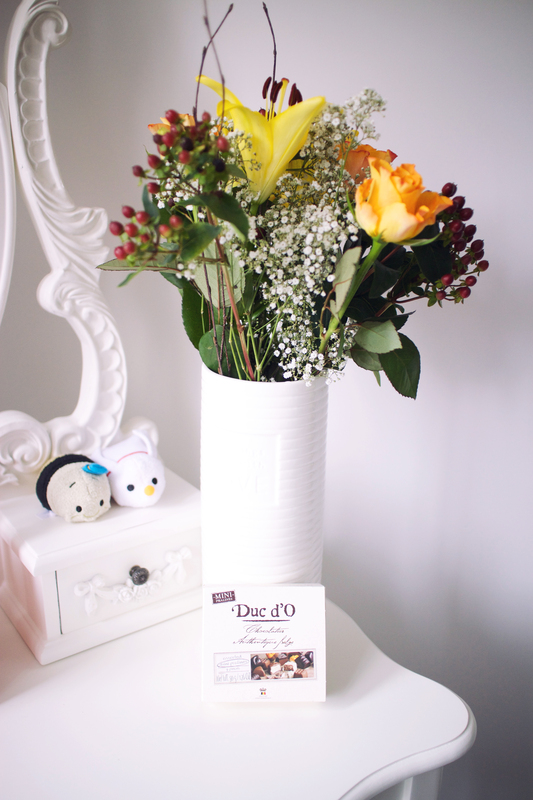 Also included were some Belgian Duc d'O chocolates (which are offered with every bouquet in the Autumn range). They went down great with a nice cup of tea! All in all the flowers themselves lasted me around a week and a half, which I thought was great given the general lifespan for roses. If you're looking for a great flower delivery company that offer a versatile selection of bouquets, including cheap flowers, then I believe Blossoming Gifts would be the place to look! omg this bouquet is stunning and the colours are so perfect for Fall! It's certainly a beautiful bouquet!